MADRID (AP) — Cristiano Ronaldo scored a late equalizer as Real Madrid escaped a bruising derby defeat at Spanish title rival Atletico Madrid with a 2-2 draw on Sunday. Ronaldo pounced on a loose ball inside the area to net the 82nd-minute equalizer — his 23rd goal of the season for the league leaders. Karim Benzema put Madrid ahead at the Vicente Calderon Stadium after three minutes but, instead of wilting, Atletico hit back with two goals to take the lead by halftime. Koke smashed a low shot beyond Madrid goalkeeper Diego Lopez, who then watched Gabi Fernandez's swerving effort from 30 meters (yards) fly past him just before the break. Madrid stayed three points ahead of Atletico while Barcelona can cut its deficit to Madrid to one point with a victory against Almeria later Sunday. The fifth meeting between the crosstown rivals since Atletico beat Madrid in the Copa del Rey final last May kept its trademark liveliness and aggression, with Atletico knowing defeat would likely end its dreams of a first title since 1996. "Atletico tried to make the game violent," Madrid coach Carlo Ancelotti said. "We don't play that way, however. But they tried right to the end." Atletico's defense played Benzema onside for the France striker to score his 15th of the season, leaving him alone to guide Angel Di Maria's cross into the box past goalkeeper Thibaut Courtois. Ugly confrontations followed as both teams used gamesmanship to try and gain an edge, with Arda Turan booked for protesting in the 11th after Sergio Ramos tripped Diego Costa inside the area with no penalty awarded. But Atletico's pressure paid off in the 28th when Turan spotted Koke inside the area to smash a low shot past Lopez into the far corner. Diego Costa, who will play at the Calderon for Spain in three days, was a physical presence and troubled Madrid throughout. The Atletico striker tested Lopez constantly, including in the 43rd when the 'keeper rushed out to block a clear chance after a smart drag by Diego Costa. Atletico took the lead in first-half stoppage time when Gabi's powerful drive beat the slow-footed Lopez for a deserved lead. In the second half, Lopez did well to stop attempts from Diego Costa and Raul Garcia as Atletico found space on the counter with Madrid pressing for an equalizer. Atletico assistant coach German Burgos was sent off for protesting with both teams knowing the importance of the match on the championship. Despite being outplayed, Madrid's attack could not be contained. Gareth Bale failed to control a cross inside the area but the ball fell to Ronaldo to extend Madrid's unbeaten run in all competitions to 28 games. "Atletico played a bruising style right to the end, when we finally got a chance to play and create opportunities," Ancelotti said. 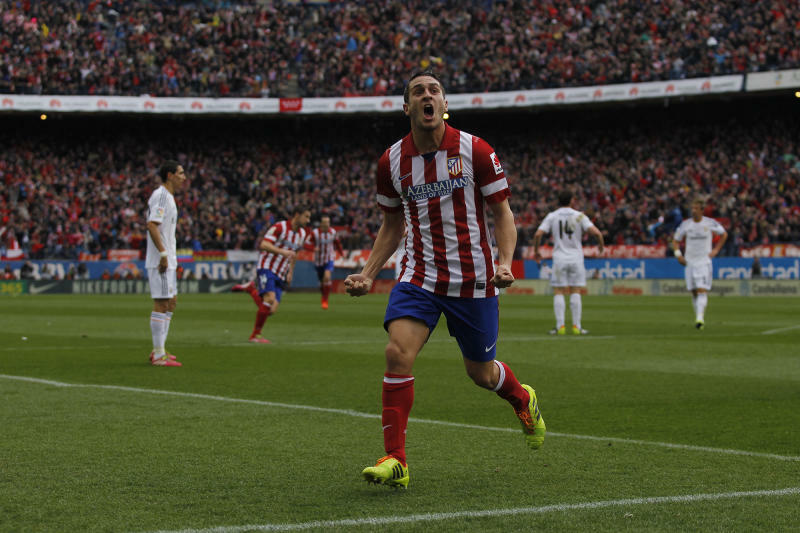 Madrid stretched its unbeaten run at the Calderon to 15 games, dating to June 1999. "The result is what it is," Atletico coach Diego Simeone said. "We had chances to win it. At least we showed we are still alive in the title race." Earlier, Ruben Castro's late goal gave bottom side Real Betis a 1-1 draw at 10-man Villarreal, which slipped six points from fourth and the final Champions League spot. Betis was left 11 points from safety. Real Sociedad fell seven points behind fourth-place Athletic Bilbao after Kevin Gameiro skipped through a pair of defenders and netted the rebound from his initial shot to lead Sevilla to a 1-0 victory. Later, Rayo Vallecano plays Valencia.